Treat blemish-prone skin to the benefits of Manuka Doctor's Neutralise Oily Skin Regime; a four-step routine enriched with high-performance ingredients from the hive. Combining Manuka, Patchouli and Argan with Sunflower Seed, Sea Buckthorn Seed and Peppermint Leaf Oils, the revitalising oil melts effortlessly into skin without greasy residue, and helps restore suppleness and elasticity by protecting moisture levels. Clinically proven to soften skin and regulate tone, the formula promotes a younger-looking complexion; it expertly reduces the look of redness, refines the look of pores and leaves the face feeling brighter and smoother. A serum that thoroughly hydrates whilst also calming aggravated skin. The treatment contains anti-bacterial Purified Bee Venom™ that targets spots and acne whilst also reducing the appearance of fine lines and scars. The serum is also infused with Manuka Honey and Royal Jelly, which help to moisturise skin. An ideal daily regime for tackling the causes of spots and acne. A deep cleansing formula that zaps daily impurities, removes makeup and moisturises to reveal a more radiant-looking complexion. The cleanser aims to combat blemishes by controlling the build-up of toxins, excess sebum production and dead skin cells. 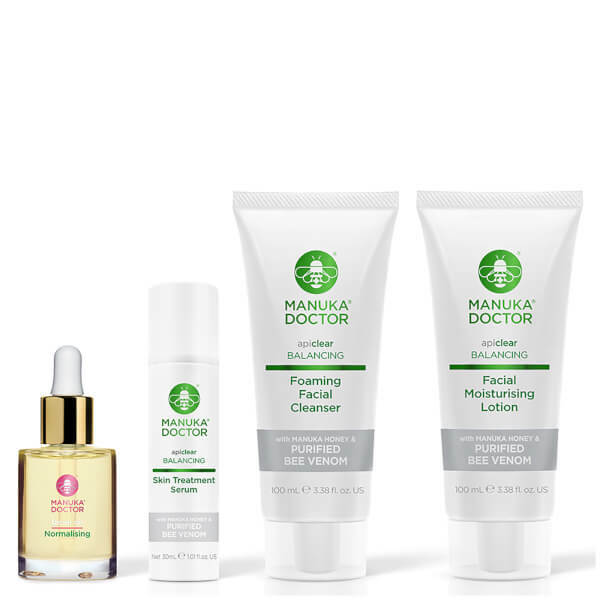 Purified Bee Venom™, Manuka Honey and Royal Jelly possess anti-bacterial, anti-inflammatory and regenerating properties to help with troubled skin. A light, nourishing formula that absorbs quickly to instantly refresh skin and provide the perfect balance of oil and moisture. The blemish-tackling lotion contains Purified Bee Venom™, which helps to combat blemishes due to its anti-bacterial and anti-inflammatory properties. Papaya Extract refreshes and cleanses skin whilst the signature ingredient Manuka Honey thoroughly hydrates, leaving the face visibly clearer and moisturised. Oil: After cleansing, dispense a few drops onto fingertips and gently massage into the face, neck and décolletage until absorbed. Use morning and night under your day or night cream. Can also be mixed into your day or night cream and applied. Serum: Apply to clean skin every morning and night. If irritation occurs discontinue use immediately. Cleanser: Lather gently between hands with a little warm water until foamy. Massage onto face and neck, then rinse off. Lotion: Apply to clean, dry skin every morning and night. If irritation occurs discontinue use immediately. Oil: Corylus Avellana (Hazel) Seed Oil, Simmondsia Chinensis (Jojoba) Seed Oil, Rosa Eglentaria (Rosehip) Seed Oil, Vitis Vinifera (Grape) Seed Oil, Argania Spinosa Kernel Oil, Oryza Sativa Bran Oil, Parfum (Fragrance), Leptospermum Scoparium Branch/Leaf Oil, Triticum Vulgare (Wheat) Germ Oil, Helianthus Annuus (Sunflower) Seed Oil, Cucumis Sativus (Cucumber) Seed Oil, Passiflora Edulis (Passionflower) Seed Oil, Sclerocarya Birrea (Marula) Seed Oil, Carica Papaya (Papaya) Seed Oil, Caprylic/Capric Triglyceride, Hippophae Rhamnoides (Seabuckthorn) Seed Oil, Mentha Viridis (Spearmint) Leaf Oil, Pogostemon Cablin (Patchouli) Oil, Calendula Officinalis (Marigold) Flower Oil, Echinacea Purpurea Root Extract, Tocopherol, Citronellol, Coumarin, Hydroxyisohexyl 3-Cyclohexene Carboxaldehyde, Butylphenyl Methylpropional, Limonene, Linalool, Alpha-Isomethyl Ionone. Serum: Aqua (water), Alcohol Denat, Butylene Glycol, Portulaca Oleracea (Purslane) Extract, PEG-40 Hydrogenated Castor Oil, Phenoxyethanol, Carbomer, Dehydroacetic Acid, Parfum (Fragrance), Glucosamine HCL, Sodium Hydroxide, Sodium Hyaluronate, Royal Jelly, Ethylhexylglycerin, Glycerin, Disodium EDTA, Calendula Officinalis (Marigold) Flower Extract, Anthemis Nobilis (Chamomile) Flower Extract, Benzyl Alcohol, Yeast Extract, Chamaecyparis Obtusa Water, Mel (Honey), Bee Venom, Potassium Sorbate. Cleanser: Aqua (Water), Sodium Lauroyl Glutamate, Stearic Acid, Butylene Glycol, Disodium PEG-5 Laurylcitrate Sulfosuccinate, Shea Butteramidopropyl Betaine, Glyceryl Stearate SE, Cocamide DEA, PEG-40 Hydrogenated Castor Oil, Glycol Stearate, Phenoxyethanol, Parfum (Fragrance), Dimethicone Propyl PG-Betaine, Castoryl Maleate, Sodium Laureth Sulfate, Glycerin, Dehydroacetic Acid, Trichlosan, Ethylhexylglycerin, Hexylene Glycol, Propylene Glycol, Disodium EDTA, Benzyl Alcohol, Chamaecyparis Obtusa Water, Carica Papaya Fruit Extract, Bee Venom, Mel (Honey), Magnesium Nitrate, Methylchloroisothiazolinone, Magnesium Chloride, Methylisothiazolinone. Lotion: Aqua (Water), Butylene Glycol, Glycerin, Pentaerythriyl Tetraisostearate, Caprylic/Capric Triglyceride, Portulaca Oleracea Extract, Glyceryl Stearate, Cetearyl Glucoside, PEG-100 Stearate, Rosa Damascena Flower Water, Dimethicone, Dehydroacetic Acid, Polyacrylamide, Cetearyl Alcohol, C13-14 Isoparaffin, Sodium Stearoyl Glutamate, Parfum (Fragrance), Phenoxyethanol, Laureth-7, Tocopherol, Lecithin, Chamaecyparis Obtusa Water, Carbomer, Hamamelis Virginiana (Witch Hazel) Water, Benzyl Alcohol, Disodium EDTA, Glycine Soya Extract, Ethylhexylglycerin, Alcohol Denat., Bee Venom, Mel (Honey), Ceramide 2.